Here are my county fair entries, four out of the five. First up is The Colors of Whirlwind. This is handspun two-ply, from a fleece purchased from Whitefish Bay Farm in Wisconsin. 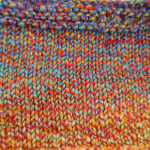 The pattern is my own, using a horseshoe lace stitch separated by purl columns, and has only left-leaning decreases to make it Combination-Knitting friendly. It got a third place ribbon in handspun garments. The judge’s comments suggested alternating skeins to decrease the color variations; I chose not to do this because I like the variation to show what Whirlwind the sheep looks like. Next up is some handspun yarn in the skein and a swatch. I wasn’t sure what I was going to do with it but have now decided it will be an op-art vertical striped steeked cardigan, for me, with some dark purple Mission Falls sport weight. 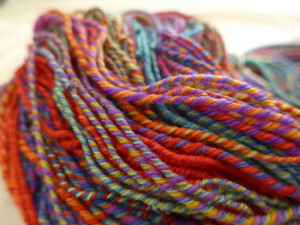 The fiber is Polworth, from Blue Moon Fiber Arts fiber club in a colorway called Prism, spun into a four ply of approximate DK weight. The skein won an honorable mention; the judge thought there were unacceptable areas of overtwisted ply. My Madrona Scarf, handspun from a batt dyed by Grafton FIbers, was not judged. 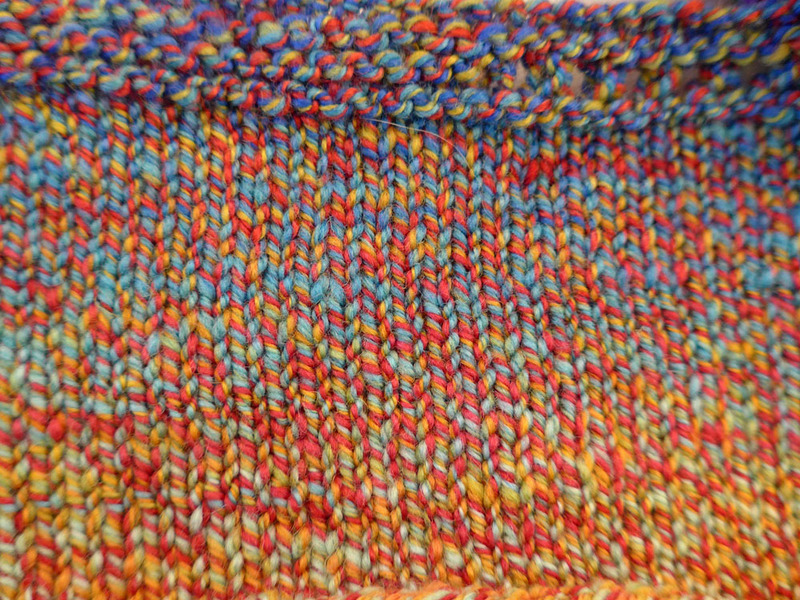 The rules required a bit of unspun fiber but I had none left, the scarf used every inch and gram. I love it and post its picture here. Next up is my Groove Scarf, modified to be shawl sized. 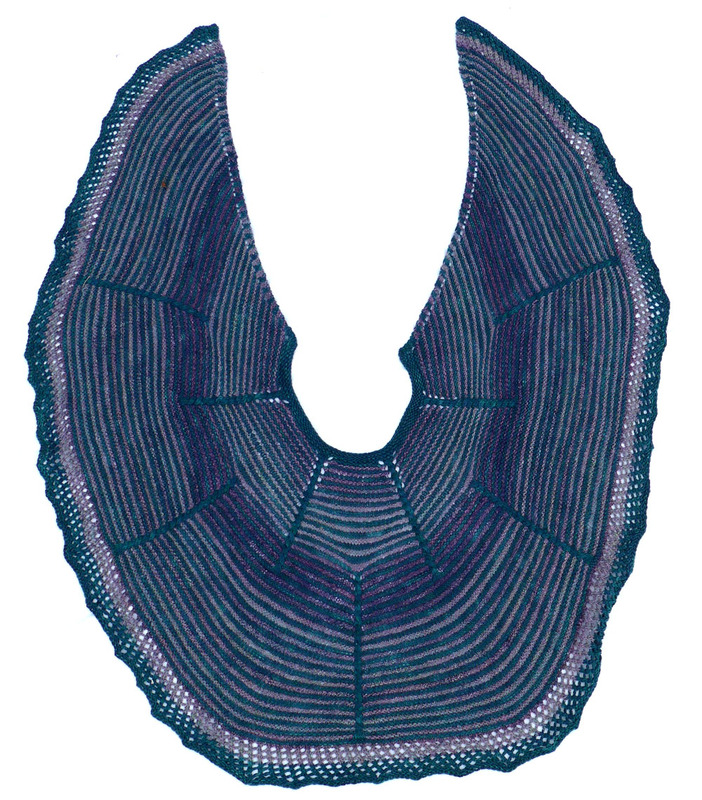 This used a combination of handspun purple and commercially spun green. 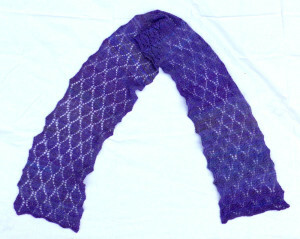 The scarf pattern is by Stephen West, modified and enlarged with an added mesh border. The judges thought it would make a nice warm shawl but because it was entered in the scarf category it got no prizes. 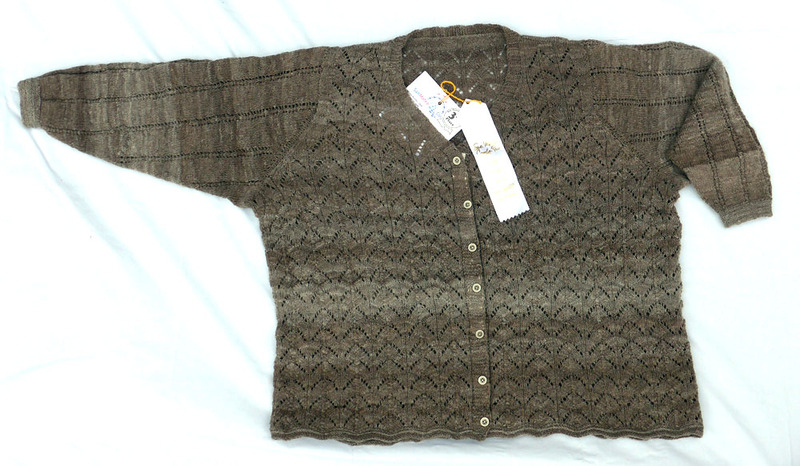 This entry was posted in Finished projects and tagged combination knitting, Hand-spun, my pattern on June 22, 2014 by nina@ninaknit.com.